The Science Olympiad Invitational Tournament attracted 1,500 students from 11 states to Wright State to compete in complex hands-on challenges and lab events. Students launched bottle rockets in the sky, tried not to break uncooked eggs traveling on small handmade vehicles and used rubber bands to fly balsa-wood airplanes at another successful Science Olympiad Invitational Tournament at Wright State University. The tournament was held in 10 campus buildings and one softball field on Feb. 7. It attracted about 1,500 students and an estimated 400 coaches and family members to Wright State. This year’s competition included 92 teams from 11 states, including Ohio, Georgia, Indiana, Michigan, South Carolina, Texas and Wisconsin. Liberal Arts Science Academy from Austin, Texas, won the high school division and Solon Middle School near Cleveland won the middle school division. Science Olympiad tests middle and high school students’ ability to solve physics, engineering, math, biology and anatomy problems in complex hands-on activities and lab events. Wright State previously hosted the Science Olympiad National Tournament in 2013 and invitational tournaments in 2011, 2012 and 2014. The university will host its second Science Olympiad National Tournament in May 2017. 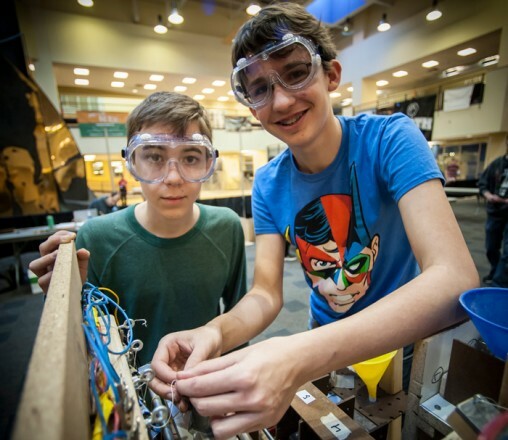 Science Olympiad is a national nonprofit organization whose mission is to improve the quality of science education, increase interest in science, attract more students to science careers, foster teamwork, emphasize the problem-solving aspects of science and develop a technologically literate workforce. “Mission Possible” challenged students to create Rube Goldberg devices to complete simple tasks. Students receive instructions at “Can’t Judge a Powder” in Fawcett Hall. In “Bungee Drop” students drop a mass attached to an elastic cord as close to the ground as possible. “Bottle Rocket” competitors launched rockets made of empty two-liter plastic bottles. Many Wright State students volunteered at the Science Olympiad Invitational. Two “Mission Possible” competitors launched a small ball in the air.